Haryana Real Estate Regulatory, Gurugram (HARERA) seems to be on a mission and they are not in a mood to give any scope to the builders where they even try to escape. The authority is implementing the provisions of RERA regarding RERA registration, RERA compliances and delivery of units. A very renowned Builder, had launched its project in 2017 which was a residential project in Gurugram and as per Section 3(1) of the RERA Act, 2016 it was mandatory for them to register the project within the timeline of July 31st,2017. 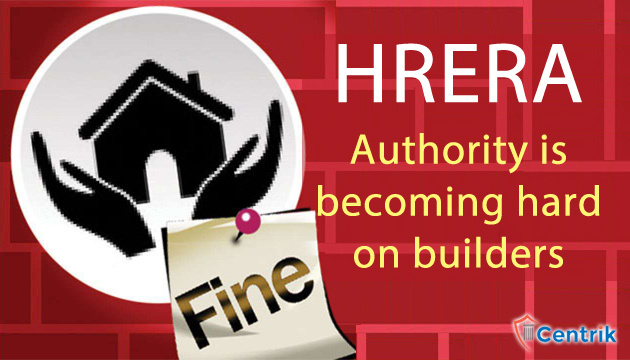 Later on the Authority found that the Company didn’t comply with the provisions of the act and by virtue of this the HRERA Authority imposed the penalty of Rs. 10 Lakhs on them along with the warning that it shall not be repeated in future. In a similar case, the HRERA Authority imposed the penalty on Indo-Japanese joint venture between Sumitomo Corporation and Krishna Group, wherein they have advertised in two leading English newspapers to announce their partnership and project named Krisumi City Waterfall Residence, sector 36A Gurgaon on Feb 26th, 2018.On its suo moto cognizance, the authority imposed the maximum penalty of Rs. 30 lakhs as they advertised about their project without registering with the RERA Authority. In another instance, the HRERA Authority also issued a show-cause notice to the Emaar MGF, wherein they failed to either appear before the authority or to response in a case which was filed by a complainant for delay in completion of the residential project. A three-member authority which is under the chairmanship of K.K. Khandelwal has issued notice to the builder to ask why they should not be charged with the penalty of Rs. 1 lakh per day as the Builder failed to respond to a notice which was issued on March 28,2018 by HRERA Authority which fetched the violation of the section 63 of the RERA Act, 2016. All the above-mentioned events are evidently showing the intent of HRERA Authority; they are not going to spare builders who think they can take the provisions of RERA for granted. Based on the above incidences, it is advised to the promoters not to take any leniency in compliance of provision of RERA and RERA Rules. Disclaimer – The above points are based on the personal interpretation. The readers are expected to take expert opinion before placing reliance on it.